Below are some videos of our 8 horsepower (HP) at 500-600 RPM steam engine running for the first time in over 40 years. Since 2007, we had been looking for some type/brand/size/make/model? of steam engine to make into a serious battery charger in case of TEOTWAWKI whether caused by economic breakdown or zombie troubles (just joking…about the zombies). As we have the internet, we searched anywhere and everywhere in North America (as shipping from Australia, Europe, Asia or Africa could be costly). Four years later we found this particular beauty (on Kijiji.ca…Canada’s Craigslist) about 20 minutes from our home on the Saint John River valley of southern New Brunswick. It was perfect, affordable at $500 CAD ($380 USD) and close; a once in a lifetime opportunity. It is about 900 pounds (409kg) without the original mated 6 kilowatt (kW) 110 volt DC generator. This particular steam engine was removed from a decommissioned (junked) World War II Canadian Navy ship. It was used on the ship to operate the outside deck lighting. You have to remember that in the 1940s, steam was plentiful on large civilian and navy ships. To turn the lights on, a serviceman (or woman) would simply open the valve. When lighting was no longer needed, the valve was closed. I am told this ship had two identical steam engines and generators…one for everyday (or night) use and one tied in as a backup. I don’t know which one I got but I am happy to have acquired such a gem. I also am glad they had two units as I would think it would be very depressing trying to fight a war in the dark. We had it hooked up to a New Yorker Boiler made in Sussex, New Brunswick Canada. …but the water on the sides and bottom just becomes warm. That warm water (on the sides and bottom) tries to stop the top water from boiling. However if you make a massive fire you can get some steam out…but very little. That is why all of our steam engine videos are short. We have since found a small fire tube boiler and hope to hook it up soon to make some serious steam and make the steam engine scream. A fire tube boiler is a different animal all together. 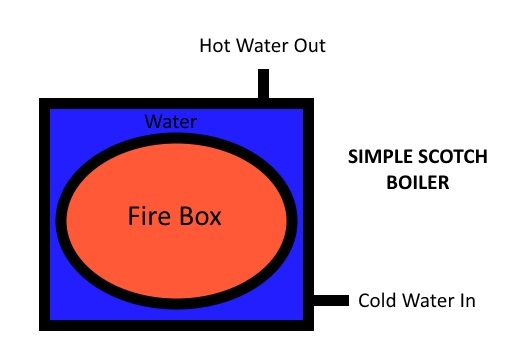 As you can see below, all the hot gases from the wood combustion go from the firebox to the chimney through little tubes that are surrounded by water/steam. The water nearest the bottom of the boiler is the coolest but the water at the top turns into steam, expanding 600 times to create the pressure that operates the steam engine. Just as a cool fact…Do you know what a water tube boiler is? You guessed it!!! The tubes are filled with water and they are surrounded by fire. Finally, after dismantling, cleaning and adjusting the speed governor, the steam engine is operating at a steady 500-600 RPM.